RRB ALP Technician CBT 2 Revised result 2019, Railway ALP Aptitude test date: Railway Recruitment Board (RRB) will soon be releasing the RRB ALP Technician CB 2 Result 2019 and RRB ALP Aptitude Test date 2019 along with the revised answer key and scores of the candidates on the official website of RRB. 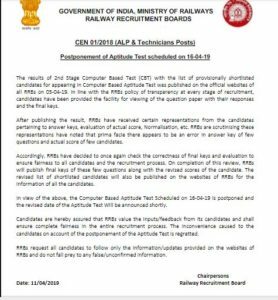 The board has cancelled the provisional RRB ALP Technician CBT 2 result 2019 after it received complaints from candidates regarding answer keys, evaluation of actual score, normalization etc. The board is now revising the final answer keys and result. The provisional list for RRB ALP Technician CBT 2 Result 2019 was released on April 5, 2019. 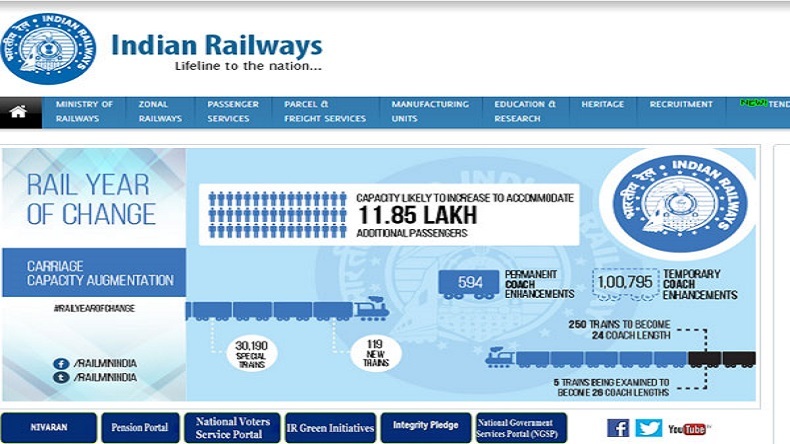 Once the review is done, RRB will release final keys of the questions along with the updated scores of the candidates. This will be followed by the publication of the list of shortlisted candidates on RRB websites. The Computer-Based Aptitude Test (CBAT) which was scheduled to be held on April 16, 2019, has been postponed till further notice. The board will soon announce the revised date of the Aptitude Test. Inline with the RRBs policy of transparency at every stage of recruitment, candidates have been provided with the facility for viewing of the question paper with their responses and the final keys. Accordingly, RRBs have decided to once again check the correctness of final keys and evaluation to ensure fairness to all candidates and the recruitment process. On completion of the review of answer keys, RRBs will publish final answer keys along with the revised scores of candidates. The revised list of shortlisted candidates will also be published on the websites of RRBs for the information of all the candidates. Candidates should also note that the Aptitude Test will be a computer-based one or Computer Based Aptitude Test (CBAT) comprising five tests. The candidates will be required to secure a minimum T-20 score of 42 in each test of the test battery to qualify for the post of Assistant Loco Pilot. This applies to all the candidates and no negative marking will be done. Railway Recruitment Board conducted the recruitment test on 21, 22 and 23 January 2019 at various centres for the post of Auto Loco Pilot (ALP) and Technician. A total of 64, 371 vacancies are expected to be filled through this recruitment process this year.